A car accident is usually a sudden and violent thing. In fact, an accident is often over even before we even realize what’s happened. In those first seconds after a wreck, even a slight fender-bender, we might be in shock, our heart racing, and we might even struggle to remember what happened. But there’s another part of car accidents that can sometimes be even more dangerous, both to the drivers and to others in the area—fire’s that can break out after an accident. Take the example of a tractor trailer that crashed in Houston area, on the North Freeway. In the middle of the night, the driver apparently lost control on an entrance ramp near Parramatta and crossed four lanes of traffic before coming to rest on the opposite shoulder. And that’s when the spilled diesel burst into flames. 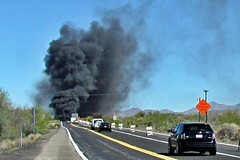 The flames spread quickly and powerfully, causing traffic to stop because of the danger. Eyewitnesses report that the fire just grew and grew, spreading across to the median. HazMat crews worked through the night to clean up the spilled fuel. If you’ve been burned in a car accident, or if you’ve suffered any other kind of injuries, don’t rely on your insurance company to fight for you. You need qualified legal representation can help you get the help you need to get better and return to a normal routine. Out attorneys can fight for you, and we won’t charge you a penny until we get a settlement for you. Call now for a free consultation.